The new DVD Finding Birds in Northern Greece shows you how fabulous the birding is at many sites in northern Greece, from lake Prespa near the Albanian border, to the Evros delta near the Turkish border. It features the best birds of places such as Lake Kerkini, Porto Lagos, Dadia forest, the Nestos and Axios deltas and several mountain sites. For the first time on any European filming trip Dave filmed over 100 species, giving you an idea of just how exceptional northern Greece is. Learn about the sites – find out what it's really like to go birding in 19 sites; get an idea of what birds you might see and how close you could get to them. Enjoy the birds – sit back and enjoy footage of over 100 species, with some of the best birds featured several times, all filmed using high-definition digital video cameras. Helpful tips – find out more about the sites and their birds, including hints on how to find difficult species such as Rock Partridge, Spur-winged Plover and Masked Shrike and how to locate birds such as Olive-tree Warbler, Semi-collared Flycatcher, Rock Thrush, Eastern Orphean Warbler, Eastern Bonelli’s Warbler and Barred Warbler by their songs or calls. This DVD has been produced in conjunction with a book of the same title so it’s easy to find out all you need about every site in the film. The DVD is ideal for showing you each place and its birds and the book is perfect for giving you lots more information, including detailed maps, in a portable format – together they make the complete guide. 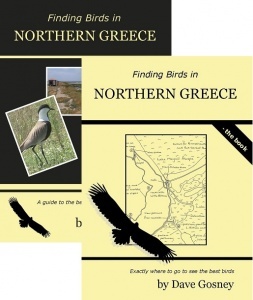 Northern Greece is undoubtedly one of the best birdwatching areas in Europe.